Our team was honored to host the Mighty Hurricane NJROTC. I felt very privileged to get a glimpse of these future leaders. Everything you see in the picture was made in a day. 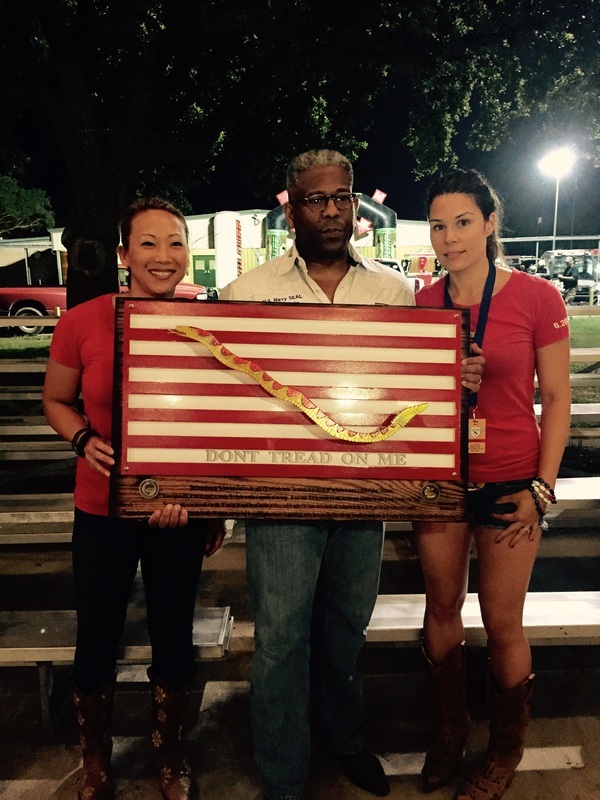 Hand Chiseled Mahogany flag was donated to the Hudson Foundation. We were proud to raise $3000 for the team. Hand chiseled Cherry flags were crafted with the assistance of Gold Star employees. These flags were given to deserving companies and individuals who live a lifestyle of making the world a better place. 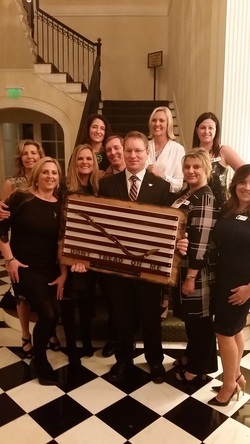 The Rosie Network is a non-profit founded by military spouses whose mission is to promote our military family-owned businesses to the public by making it easy to find them. What does it cost to use our Rosie's List search tool? Nothing. Nada. Zip. 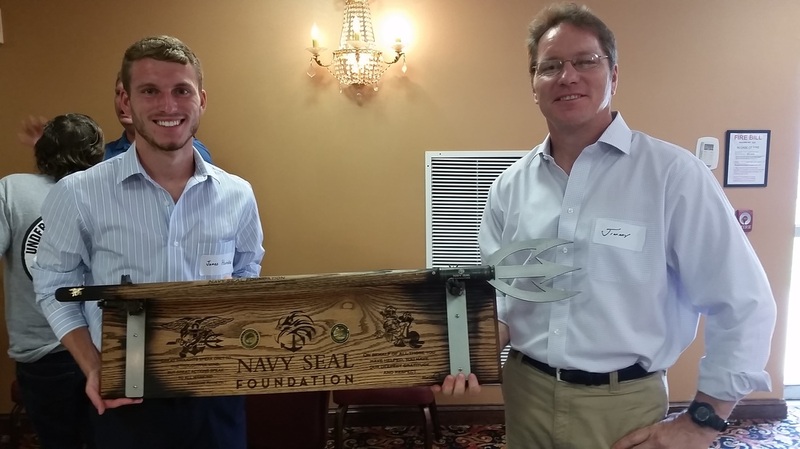 Trident Scepter presented to the Navy SEAL foundation and the UDT SEAL Association. This plaque was auctioned off at a Texas fundraiser. 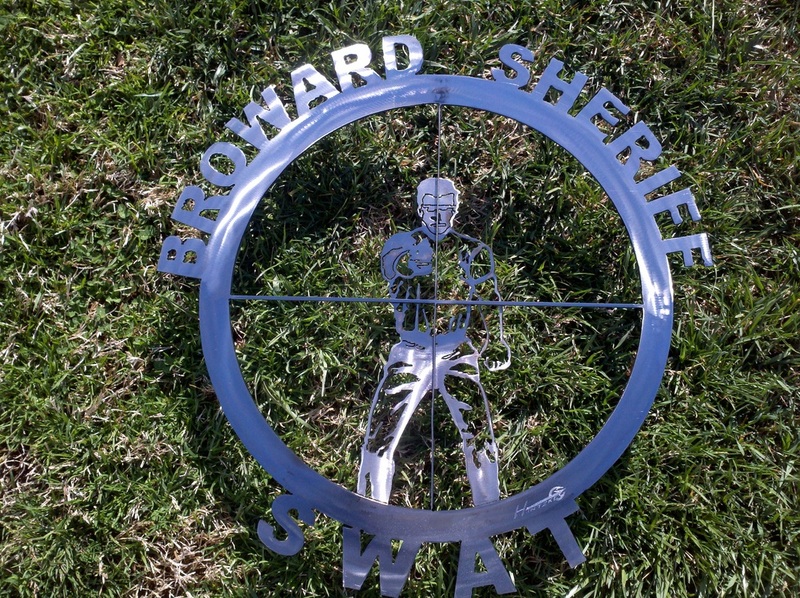 This plaque was donated to Broward County SWAT. Their sustained superior support to our special operators is much appreciated! 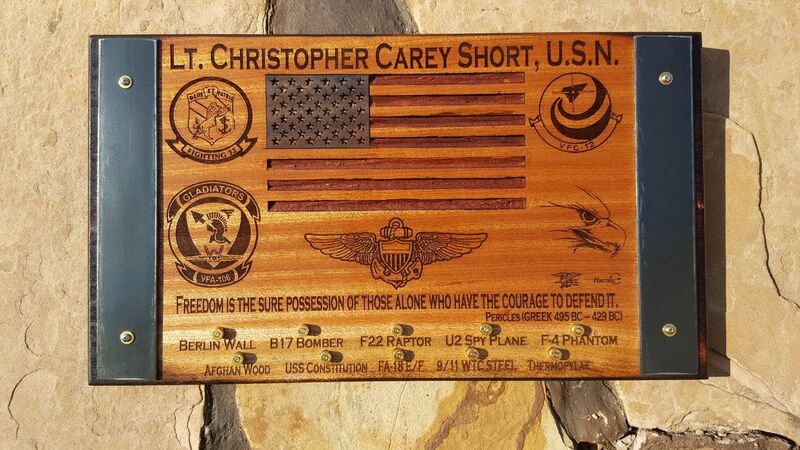 My son and I donated this plaque to the finest Snipers in the world. Their commitment to excellence has no peer. 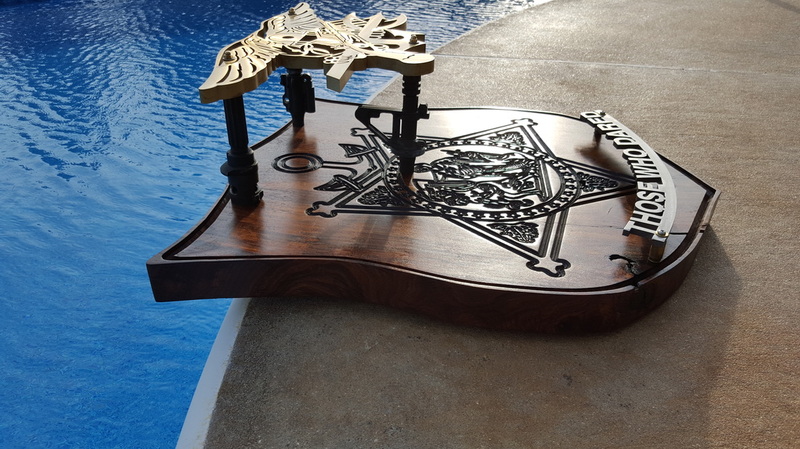 This mahogany table was crafted for our nations finest. It is an incredible 3" thick. The legs were milled from shot out 50 caliber gun barrels. Nautical banding is held in place with copper rivets. We were very proud to have the opportunity to make it. This Piece was donated to Virginia Beach, Landstown High School's Spanish Honor Society. 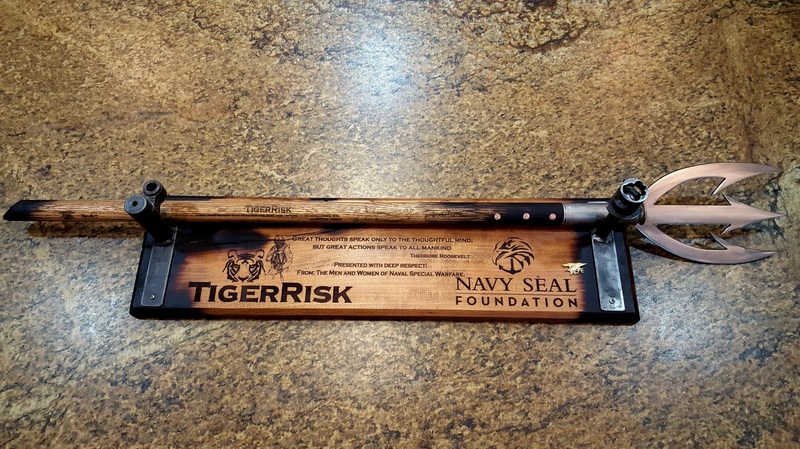 TigerRisk Partners is the standout, specialized firm that avoids the hierarchical drag and conflicted interests facing large conglomerates today. They are also a world class supporter of our Special Operations forces. We are very thankful for all they have done. 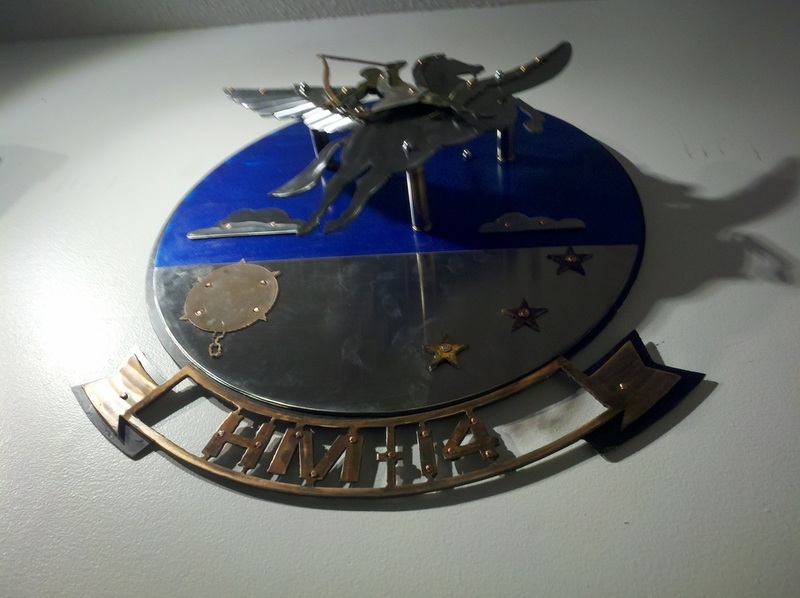 This piece was donated to the National Intrepid Center of Excellence. NICoE. Their team has and continues to do remarkable things with SOF operators who have had serious injuries to include Traumatic Brain Injuries. They truly are a gift! Donated to Surf Adventure. Over the years, their commitment to Naval Special Warfare has been impressive. Our Gold Star Families are incredibly special. These pieces were made for Gold Star Young adults who have taken up significant leadership positions within their community. Setting an example for all of us to emulate. We are very proud to have been able to craft and present these well deserved gifts. Funding support was provided by a wide number of Naval Special Warfare Men and Women. A great Team effort! 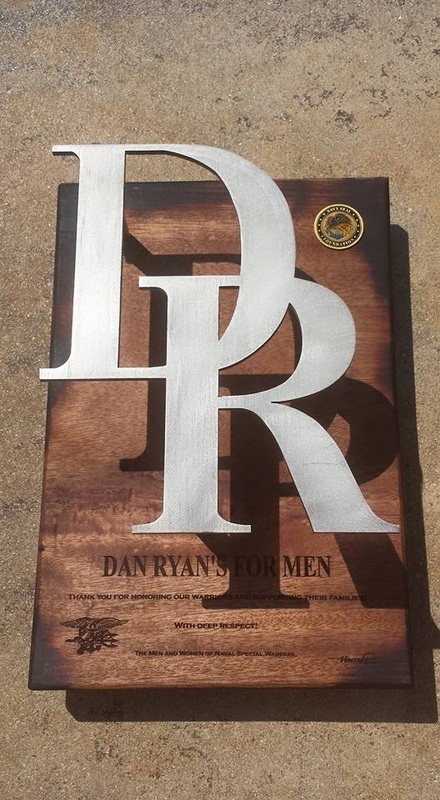 Dan Ryan's For Men continues to be a world class supporter of the military. They deserve our heartfelt thanks! 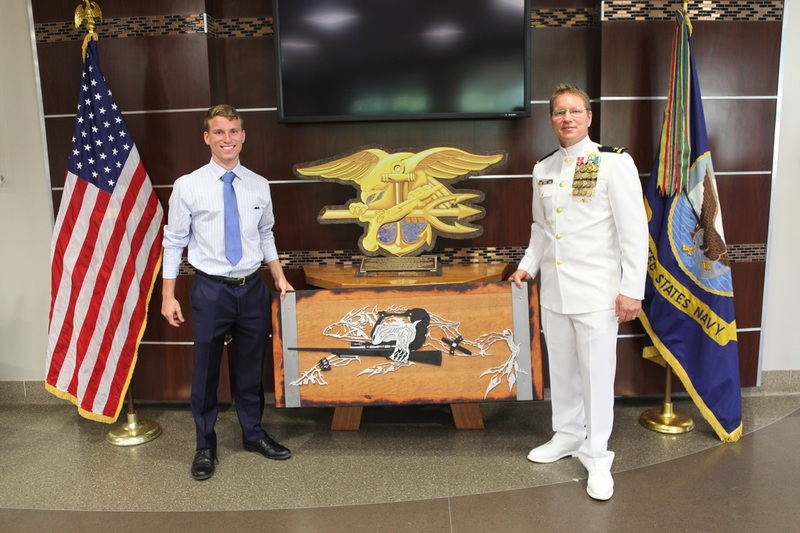 With the help of my son, we crafted and presented this piece to the LT Sean Snyder's family. Lieutenant Sean Snyder is a decorated pilot, a man of honor, dedicated husband, and father, who is proud and grateful for his privilege to serve his country in the United States Navy. On 8 January 2014 his MH-53E Sea Dragon crashed off the coast of Virginia Beach VA. LT. Sean Christoper Snyder and two others were killed during the tragic accident. 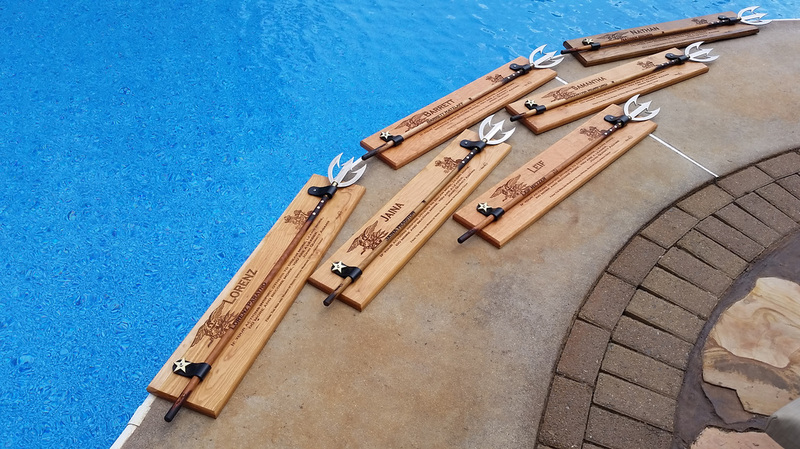 We crafted these pieces in honor of my good friend Heath Robinson. He was an amazing operator and a visionary. He spearheaded initiatives that continue to flourish. I am proud to see the significant positive impacts they have had on our Special Operations community. What an amazing legacy to leave behind... One of these plaques was presented to Heath's daughter. 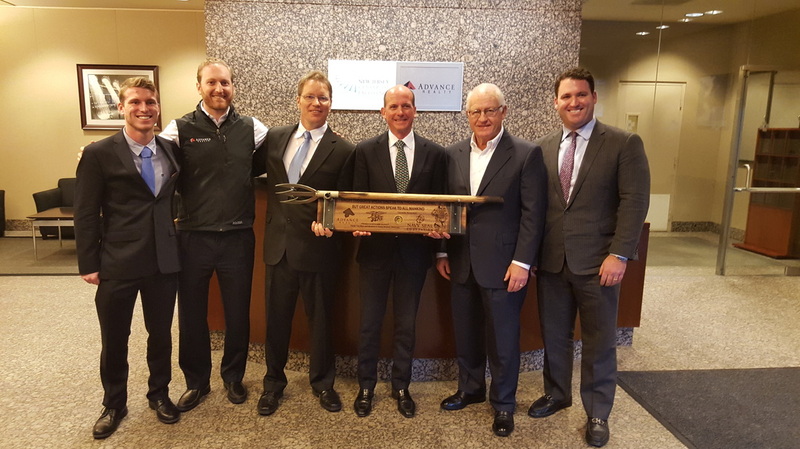 The second was presented to the Michigan Department Of Transportation. In October 2015, they dedicated a bridge to Heath. It was done with style and respect. We felt it important to recognize them. Great Americans!! These 2 1/4" thick slabs of lumber were brought back from Afghanistan. It was an emotional build, bringing me a smile every time I thought about Heath. This piece was crafted for the Advance Realty Team. Their business ethics and sincere dedication to their people is an example for all of us to follow. Additionally, they have and continue to support the Navy SEAL Foundation. 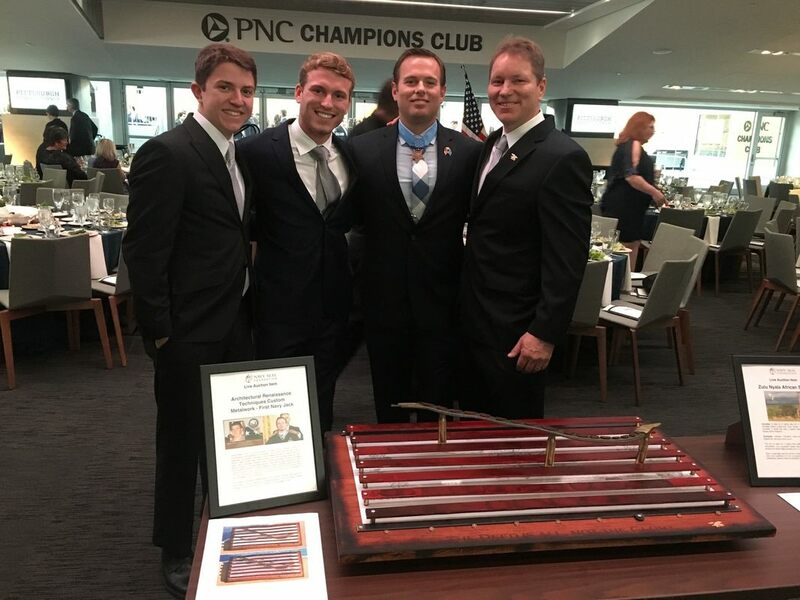 We were deeply honored to be their guests and present them a memento of thanks from the men, women and families of Naval Special Warfare. Over the years, I have had the honor to craft over a thousand pieces for people. 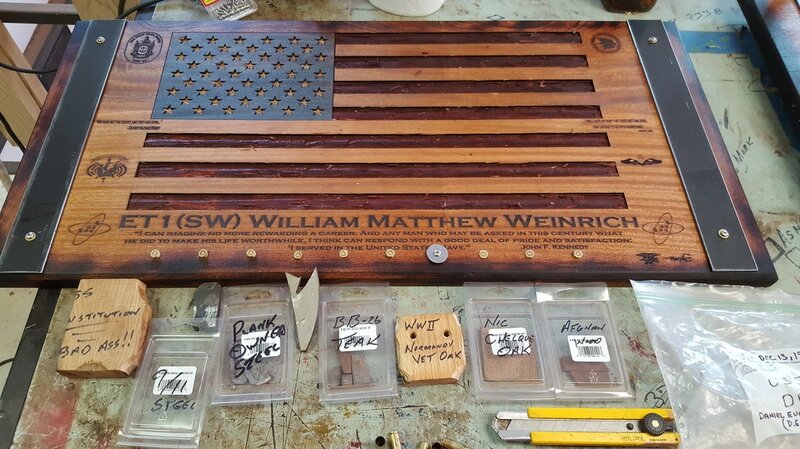 Everything from retirement chests, shadow boxes, paddles, building signs, gifts for the families of our fallen and so on. The scope has more than a few emotional ties. For me, this piece is one of the most special. I was originally inspired by a very good friend of mine. His niece, Jennifer Lynn Kane was lost on 9/11. 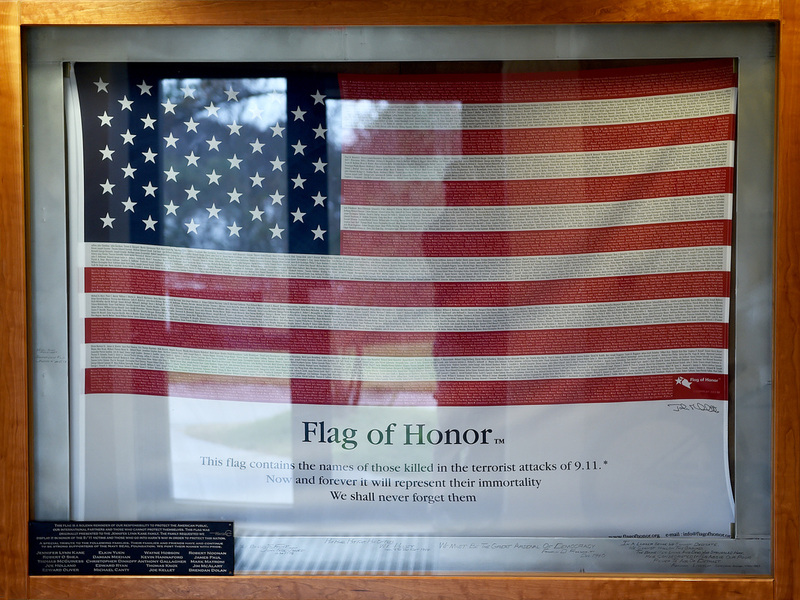 He had one of the original Flags of Honor (see below) that was presented to the family. I asked Terry if I could encase the flag. The responsibility to properly honor all involved was not lost on me. 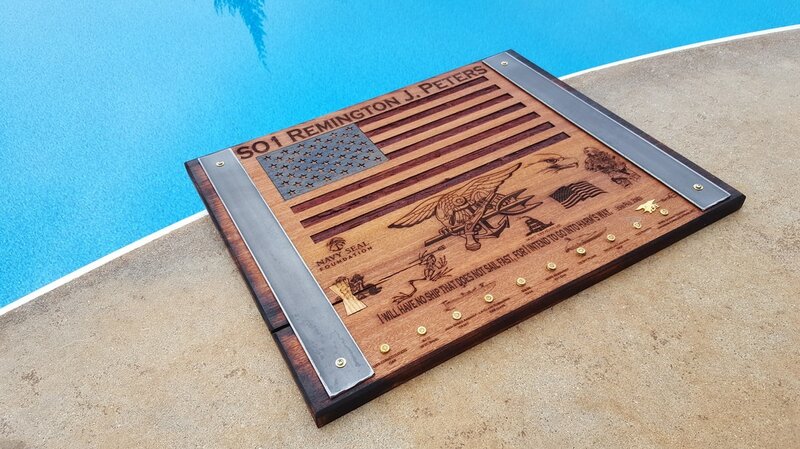 The Flag case is crafted from solid American Cherry wood. It was purposely made to be deep. The entire frame is close to 8” deep. Each corner of the flag is held in place by hand crafted brass clamps. The intent was to allow the flag to “Float” about 3” from the back plate. LED Lighting is installed behind the matting. During the evening hours the flag is lit for all to appreciate. John Paul Jones is the father of the United States Navy. 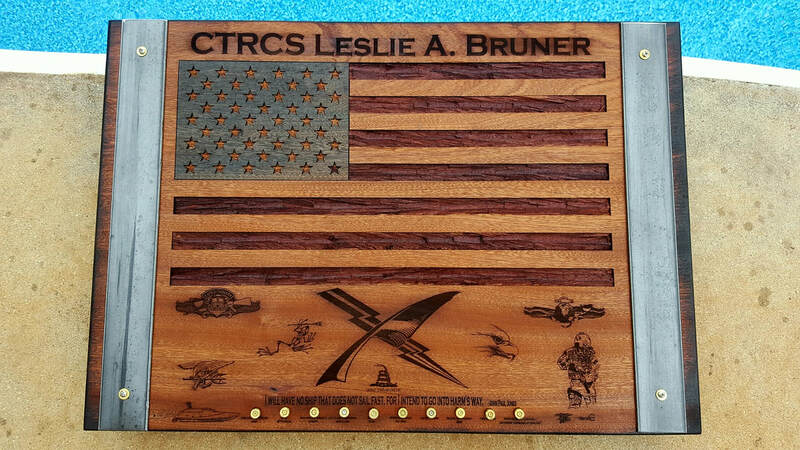 The laser engraved plate was added after last year’s NYC Navy SEAL Foundation gala. Inma (my spouse) and I had the great fortune of having dinner with some amazing Americans. During the event, I told them about a 9/11 piece we made. It became clear that we had an opportunity to recognize some of their close friends and family. 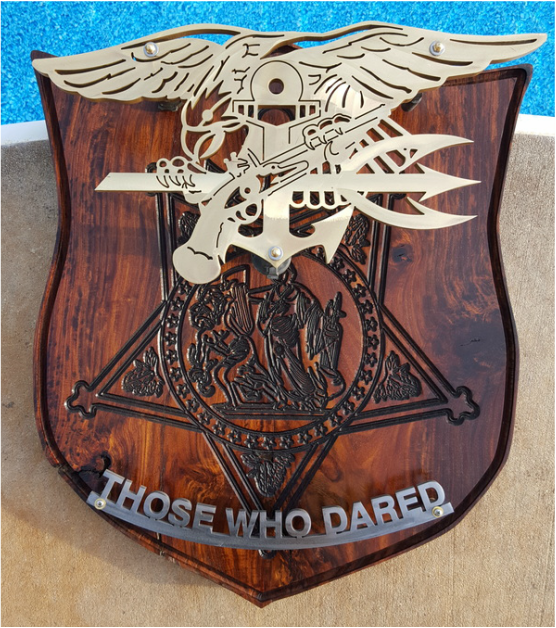 This piece was presented to the EOD Warrior Foundation at this years 9th Annual Polar Bear Plunge in Fredericksburg VA.
Special thanks to everyone who came out and supported a great cause and some amazing operators! 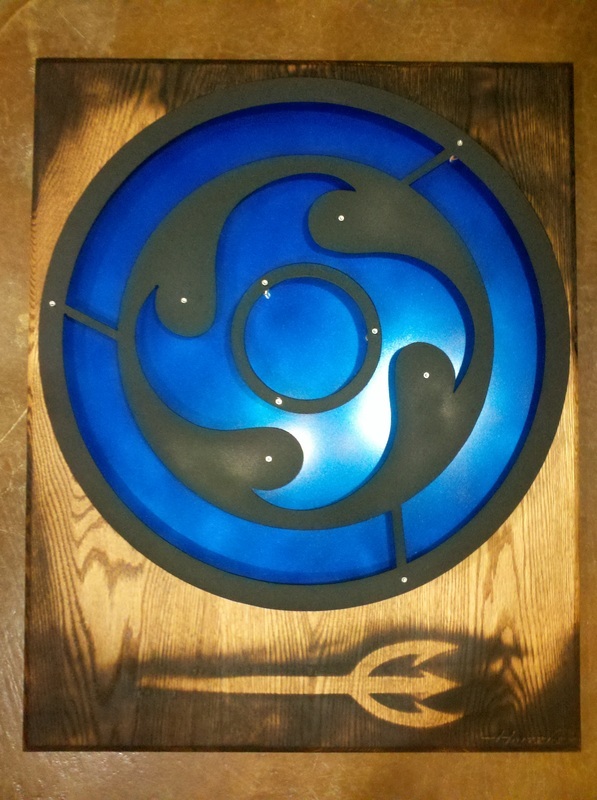 Recently, we were commissioned to make this piece for a fundraiser. 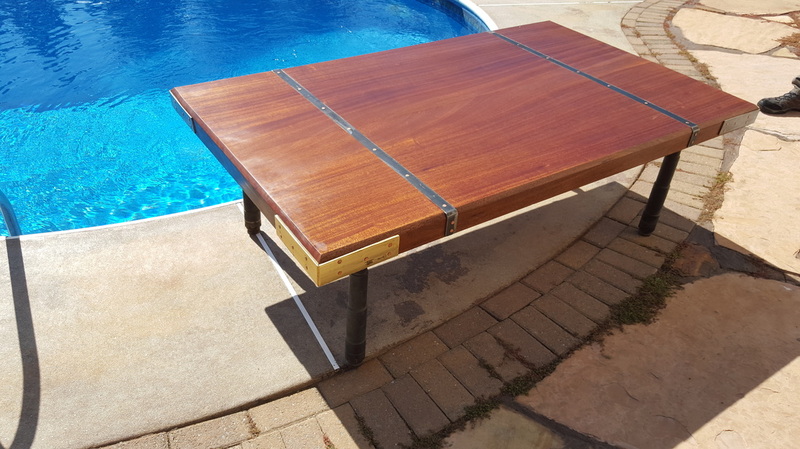 The combination of translucent stains and mahogany make the piece shine. Each of the weapon casings contains a some amazing materials. The 9/11 steel is from the twin towers. I have a very small piece that was removed from a memorial during its construction. It was given to me by a friend who saw how we would use historically significant materials in honor of great people. I am deeply honored to be able to use it. It is a solemn reminder that we have a long way to go and our job is far from complete. 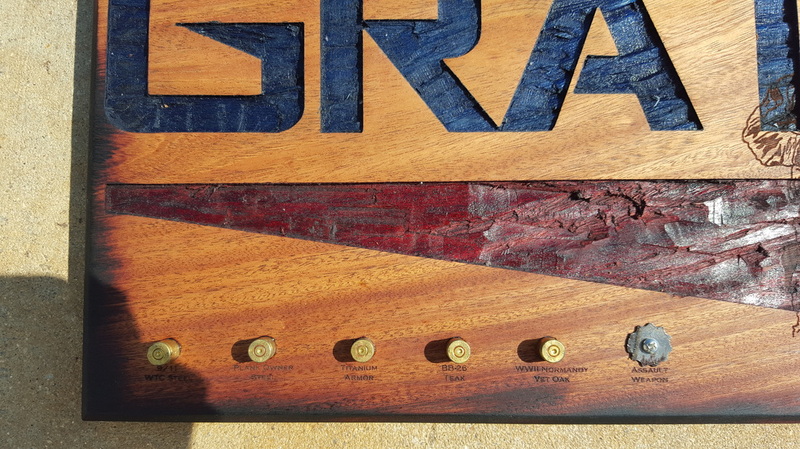 The Oak inlay is from a Veteran who was on the second wave of the Normandy invasion. Fought his way across Europe and was wounded in Bastone. He was awarded the French Legion of Honor for his efforts. He went on to raise a family and his son was a military surgeon during the 1993 Mogadishu Black Hawk down event. When you read their bios, you want to be a better man. The gun barrel went on numerous deployments. Where they went and what they did protected this nation against a very real danger. The BB-26 Teak is from the deck of the Mighty USS South Carolina. It pays respect to our Naval Heritage. During its day, the Battle ship was the most respected weapon in the world. The titanium armor came from some of our vehicles. ​The BB-26 Teak is from the deck of the Mighty USS South Carolina. It pays respect to our Naval Heritage. During its day, the Battle ship was the most respected weapon in the world. 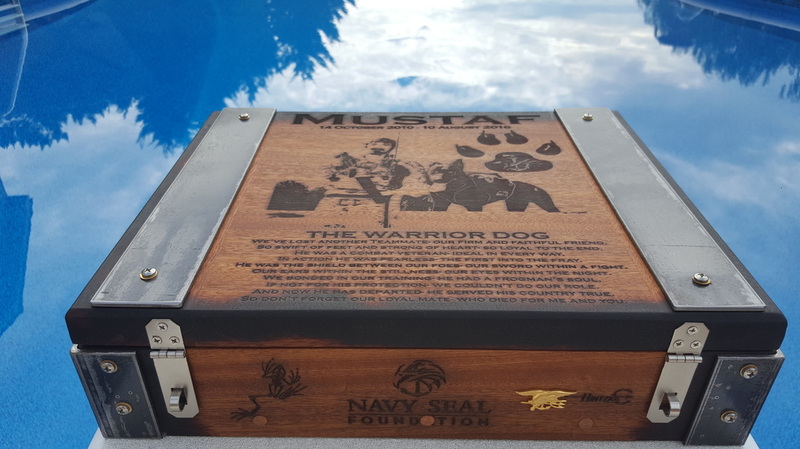 The Navy SEAL Foundation commissioned us for this build. We were very proud to work with them in recognizing an american Hero. –The base wood is Afghan, symbolizing our strong NSW contribution during combat operations there. 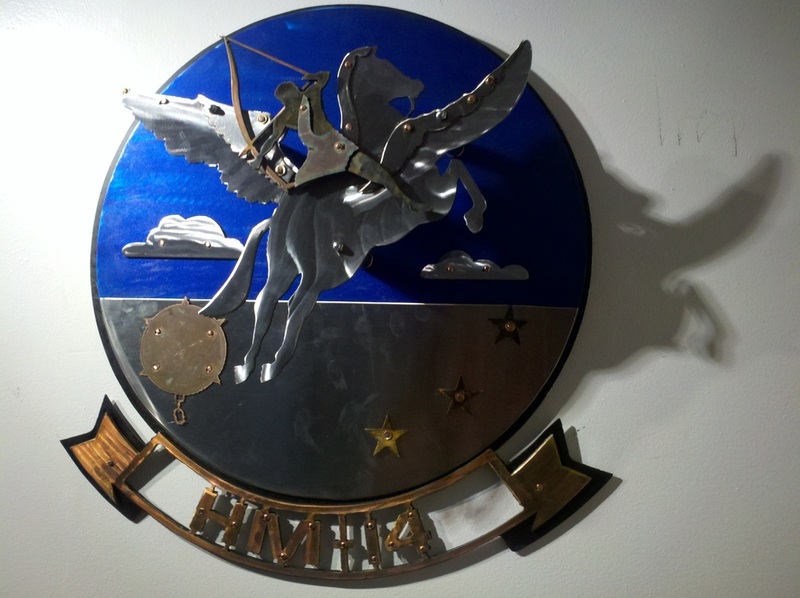 –The Naval Medal Of Honor emblem is engraved into the wood background. - A Trident is cut from ½” Brass plate. •The Trident stands off from the background by actual Naval Special Warfare gun barrels used during combat operations. •“Those Who Dared” verbiage is cut from ¼” Titanium. –Pistol gun casings provide a standoff from the background.•Center – Steel from the plank owner cages of a hostage Rescue unit. – 9/11 World Trade Center Steel is embedded into the top of the piece. –Teak from USS South Carolina Battle Ship is embedded into the top of the piece. •Naval Heritage; The USS Constitution is made from White Oak. •This white oak was originally purchased by a veteran of the Normandy Invasion. He received the French Legion of Honor for his service! He passed the wood on to his son. He became a surgeon who worked with elite units during significant combat operations. 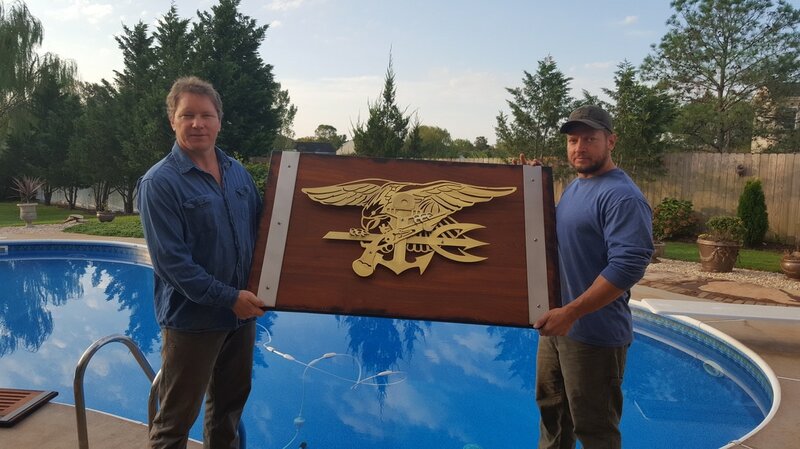 The wood was passed on to a retired Navy SEAL. It now, is passed on to a Navy SEAL Medal Of Honor winner! Engraved quotes from: –Oliver Hazard Perry. He was an American naval commander known as "The Hero of Lake Erie"
This shield was built a number of years ago. It is crafted from steel and solid brass. All of the components are fastened with copper and brass rivets. There is an unmistakable look to a hammered appearance. I was not willing to sell the piece. 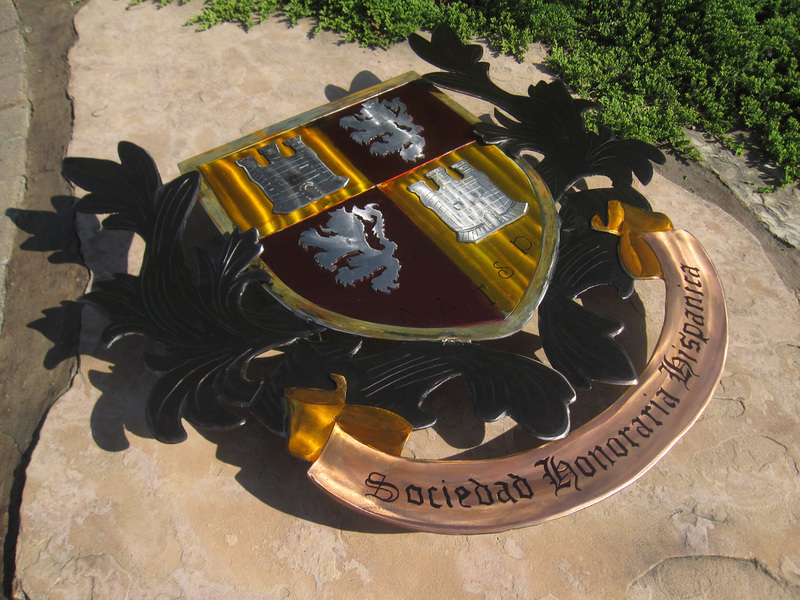 It was one of the finest shields we have ever made and had personal significance for me. For those of you who believe that most things happen for a reason, it became clear who deserved this shield. 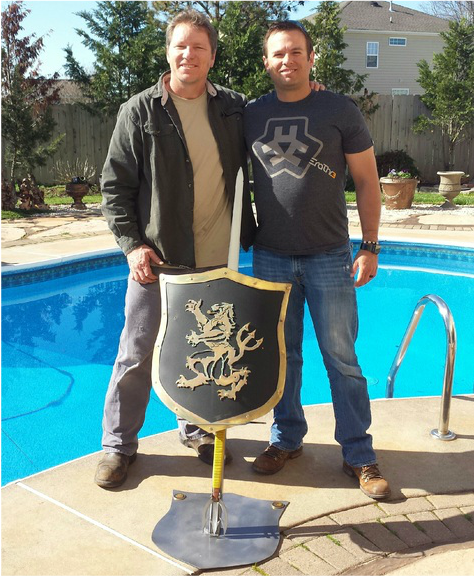 Medal of Honor recipient: SENIOR CHIEF SPECIAL WARFARE OPERATOR (SEAL) EDWARD C. BYERS JR. For years, Ed has been a great friend. He now is an american Hero and example for all of us! The broadsword mount was made much later. We think it compliments the piece. It is also a functioning sword. How is that for home defense? Written words are unable to capture the commitment and bravery executed by our four legged teammates and their handlers. We were very honored to donate this urn. Special thanks to the Navy SEAL Foundation. Once again, they made another difficult moment a class act. This piece was presented to our NRA brothers and Sisters. Over the years, they have been amazing supporters of a wide range of deserving groups. This piece was signed by Medal Of Honor Recipient Senior Chief Ed Byers. It also contained USS Constitution Oak, Battleship South Carolina teak, 9/11 World Trade Center steel, WWII Normandy Veteran oak, plank owner steel, Afghan wood, assault gun barrel and Titanium from our armored vehicles. 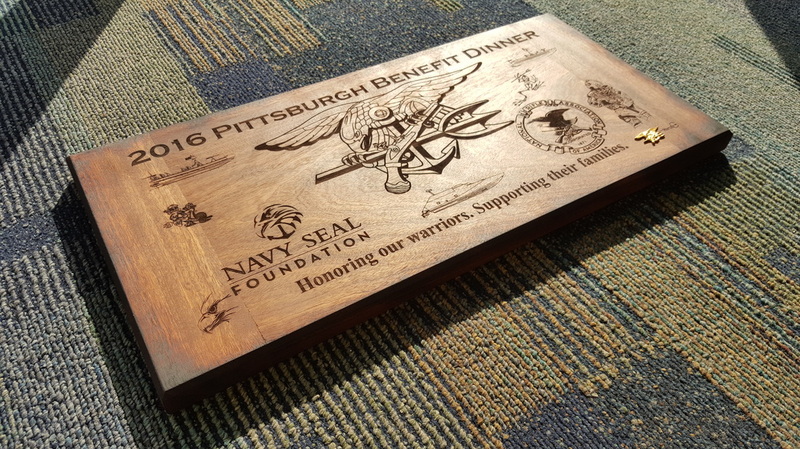 Our Team was very proud to be a small part of the NAVY SEAL Foundation Pittsburgh Benefit Dinner. Danny Dietz Memorial Trident. We donated over $1000 in brass to this build. The customer paid for steel, we just could not make the piece with anything less than the best. Danny gave his best to all of us. 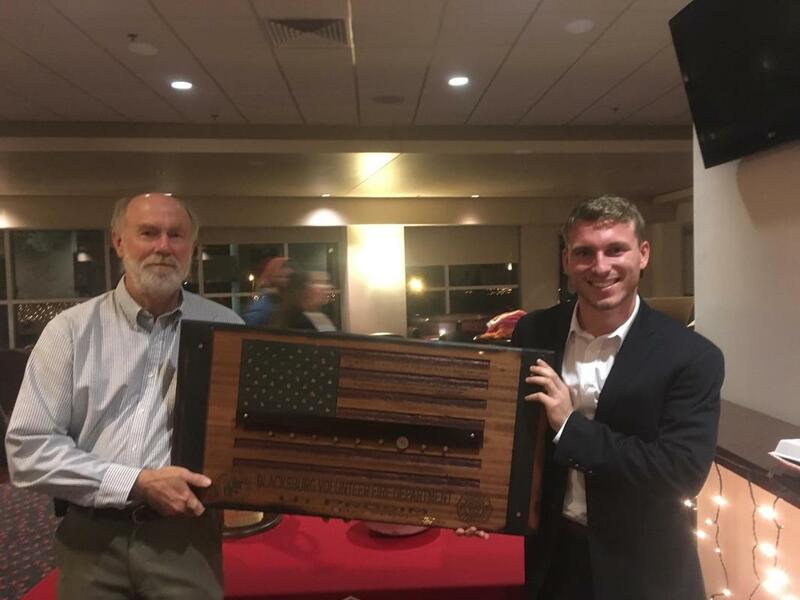 Thin Red Line flag donated to the Blacksburg Fire Department. As many of you may know, my son, Jimmy (pictured to the right) is an engineering student at VTECH. I feel a personal debt to the Blacksburg first responders. They are teaching my son the importance of service, being part of something greater than yourself and self sacrifice. 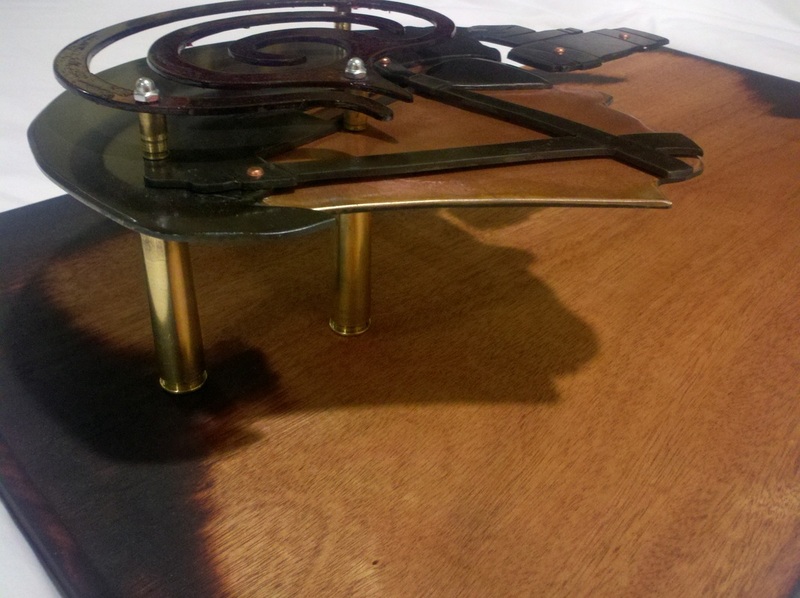 This piece contains actual pieces of the World Trade center, USS Constitution and much more. This year, we started our Santa"s Workshop Saturday. The intent was for young adults 12 - 18 to be able to come into the shop and help build something special. We hosted two events. The first was for some of our SEAL Gold Star Kids. The second event focused on children of deployed service members. The kids made a wide range of pieces to include shields, plaques and serving trays. We basically showed them everything we make in the shop and kept a close eye on what resonated with them. The only items off limits were weapons. We do make some great swords and such, but Santa told us those were off limits for this event... In 2017, we plan on reaching our to local first responders, and adding a weekend for them too. 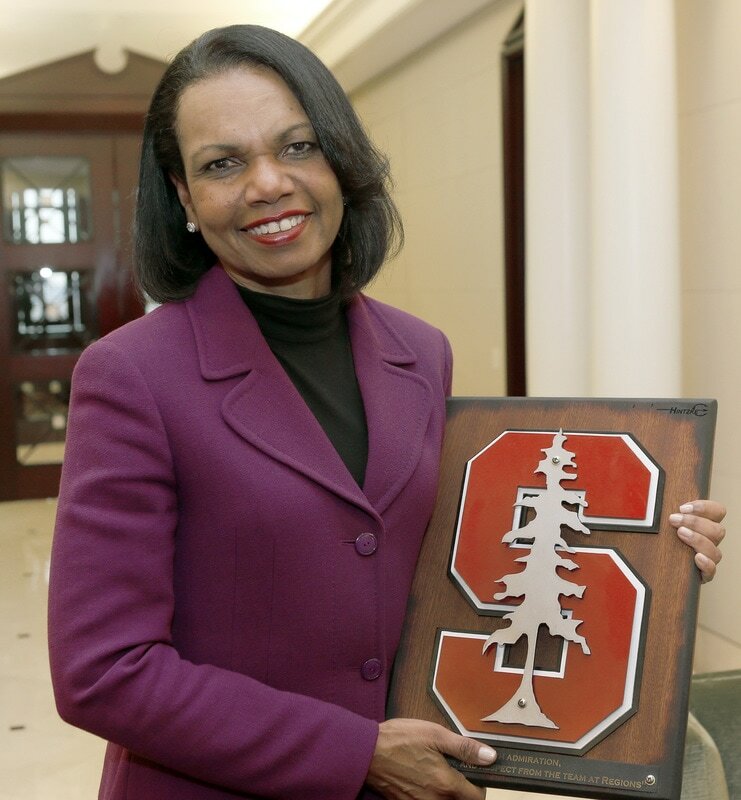 I was deeply honored to serve under Dr. Rice in Iraq and Afghanistan. When the team at Regions Private Wealth Management asked us about making something to honor her service, we were immediately "All in". Rick Swagler and Blair Thompson are cut from a different cloth. It seems our team gets a little better every day. 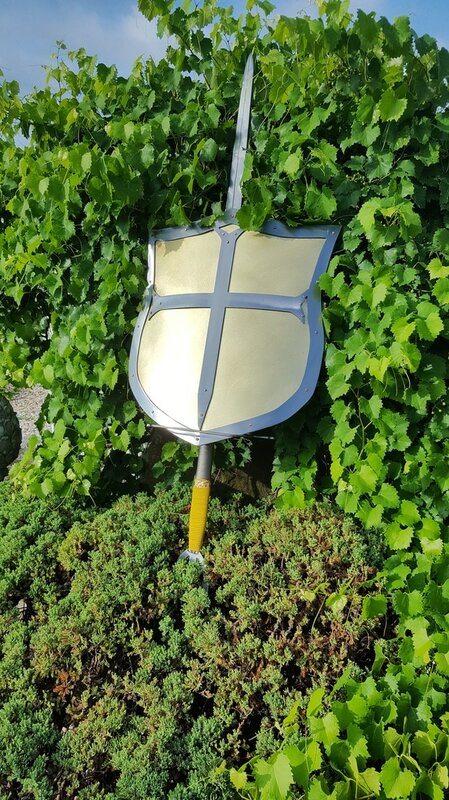 This Functional shield was crafted for a respected friend. He retired after serving over 30 years as a machinist. He had an amazing work ethic and ability to solve problems. His impact will be felt for years to come. Plenty of symbolism in this one. A Templar shield with a SEABEE, flintlock, trident, calipers and a wide range of warfare devices.